Perhaps somewhere at this very moment, Kim Kardashian is breathing a sigh of relief. Now her 72-day marriage to Kris Humphries makes her look great. 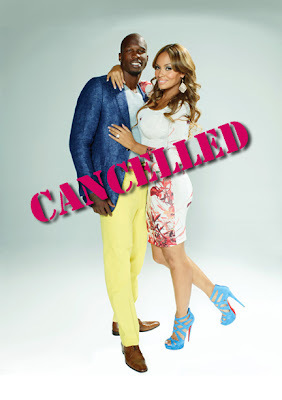 Evelyn Lozada of 'Basketball Wives' fame is filing for divorce from Chad Johnson (formerly known as Chad Ochocinco) after only 41 days as a result of a domestic dispute that happened over the weekend. 3" gash on her forehead and was later taken to the hospital to have it treated. Johnson was taken into custody and released on $2500 bail. For those of you who watch Basketball Wives like me, weren't particularly shocked by this as we've witnessed Evelyn throwing wine bottles, hopping over tables to pounce on her castmates and just being really aggressive in general. As for Johnson, well, he's a cocky A-hole who plays professional contact sports for a living. That sounds like a recipe for disaster to me! Now, not only was this a terrible thing but later that day the Miami Dolphins also released (fired) him from his position and VH1 cancelled the upcoming show "Ev & Ocho" (which was already completed). Stay tuned tomorrow to find out how this fiasco has now made me a fan of the show "Hard Knocks" on HBO. I can almost guarantee it will be your new favorite, too. It's basically a reality show that documents the Miami Dolphins training camp. My husband has been wanting me to watch it for ages and when I found out that Chad and Ev were prominently featured on the pilot episode, I was IN! Wait until you hear all of the juicy stuff that comes outta that show. I kept having to make Mike pause it because I couldn't write that fast! Seriously, it's that good. "What happened to your f%#$ing eyebrows?" I've been MIA...as in Miami! Schedule, schedule, Wherefore art thou, schedule? Football heels. Highly impractical but SO cute.